Anger is such a strong emotion that it can be very confronting to see it in our child, particularly when they are so young. The display of anger can sometimes be such a massive, out of control response that we frequently don’t know what to do. Parenting is no longer this lovely, wonderful experience. It’s at times like this, that it becomes really challenging and hiring Mary Poppins is highly appealing! So we often do all that we can to stop their anger and their tantrums. We may pacify, desperately try to fix the situation, get angry, threaten them, ridicule their behaviour or ignore them. There is a school of thought of not ‘rewarding’ anger tantrums with our attention and that once the child learns they will not get their way or have the response they want, they will learn not to be angry in such a way again. And yet, being angry is a perfectly natural emotion and is crucial in times of injustice. 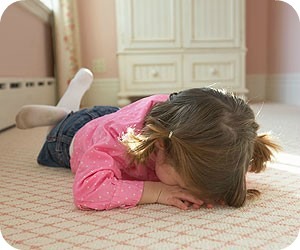 An angry tantrum is a natural physical response to a build up of stressful situations. The body naturally wants to move, to sweat, to make noise in order to release the build-up of stress hormones. Much advice is offered to adults today on how it is important to offload our stress. The old British ‘stiff upper lip’ repression is seen to be destructive for people’s physical and emotional health. It is recognised that we need to ‘let it out’, often through exercise, screaming in the car, bashing a pillow, crying with a friend, etc. Consider how you release stress. What do you do? Is it a glass of wine, beer, a cigarette, shopping, zoning out on Facebook, TV, chocolate? (Mine is having a glass of wine and munching on a block of chocolate whilst watching TV and simultaneously checking Facebook!) Whilst they can each be enjoyable, they only temporarily soothe us and can become our crutch each time we get stressed. Not great for our waist lines, bank accounts or, ultimately, our health. By feeling the anger or stress we, and our children, get to offload whatever it is that’s bothering us. It can feel horrible and overwhelming and we may even feel out of control. But once we’ve offloaded the feelings (for that is all they are), our minds become clear again to think straight and come up with solutions or resolution. And that’s why we all need a safe place in which to do it. For you it may be your partner, best friend, bloke down the pub, therapist, etc. For our children, it’s us. As Patty Wipfler, founder of Hand in Hand Parenting says, it’s a back handed compliment that our children feel safe enough to show us exactly how they feel. Children don’t always have the rational capacity to articulate what’s really going on for them. They may have a meltdown over the wrong colour plate or the fact that their favourite t-shirt is in the wash. It’s something that they can focus their unhappiness on when the real issue may be they missed you while you went away for the weekend, or someone at day care hit them. So they rage and cry and jump up and down over this seemingly innocuous incident, but all their underlying feelings come pouring out. Remember there’s always a good reason why your child is crying. There’s no need to judge it, just trust they are upset about something that deserves their and your attention. You don’t need to fix, placate or do anything other than listen. Don’t take it personally, even though their anger may be directed at you. Remember that you are their safe place where they can offload all the horrible feelings they have been carrying around for a while. Keep everyone safe. Often when angry, a child may want to hit another (including you) or themselves. When that happens, hold their flaying hands and feet and explain that you won’t let them hurt anyone. This isn’t restraining in a punishing way – the child still needs to move. It’s just to stop them from damaging themselves or anyone else. Talk to your partner or friend about what it was like. As so few of us were listened to in this way, it can be really hard for us to listen to our children when they are full of rage. It’s really important that we get to offload our stresses too. The more you can listen to your child, the more you can build their trust in your willingness to listen to their problems. By starting young, you’re building a fantastic foundation from which to enter those teenage years.